There's a stiff wind blowing out as Trey Mancini stands in to begin today's game for the #Orioles . Trevor Cahill struck out all three #Orioles batters in the first, on 14 pitches. Cahill Ks the side in the first vs. Orioles. Four Ks in a row for Cahill to start this game. The #Orioles have struck out five times in two innings. Mark Trumbo also grounded out. Trevor Cahill has used 28 pitches. Took Kevin Gausman a little bit to get his fastball going, but he's up to 94 in the second and struck out Matt Olson and Matt Chapman on particularly heavy ones. Jace Peterson removes the possibility of a no-hitter with a two-out single for the #Orioles . Jace Peterson has stolen four bags in 10 games for the #Orioles , a total that would have given him a piece of the team lead for all of 2016. Kevin Gausman allowed a second shift-enabled single, and the #Orioles were so convinced they had an inning-ending double play on review that they were in the dugout. They did not. He's out of it on 37 pitches anyway. Pedro Álvarez strikes out to leave Trumbo, who advanced on a wild pitch, at third. Cahill matches his career high with 10Ks. It's the fifth inning. That's 11 Ks for Cahill through 5 IP. Trey Mancini had a swinging strike rate of 10.35 percent before he banged his knee on a brick wall. Since then, not counting his 2 Ks tonight, it's at 22.64 percent. Throwback....Saturday? Cahill's using Jefferson Starship, Canha is using Bob Dylan for his walkup music. Kevin Gausman had an 11-pitch fifth inning, and has pitched very well today. The #Orioles have not scored for him. That's a dozen Ks for Cahill. Cahill is at 98 pitches through six. Will be interesting to see if he's back out for the seventh; he's certainly on a nice roll. Cahill is done after six innings and 12 Ks; Yusmeiro Petit takes over for the seventh. 0-0 at the Coliseum. Petit allowed five hits and three runs last night. The two walks this inning are the first two Petit has issued all year. Kevin Gausman's 99th pitch of the night is a 95 mph fastball past Matt Canha for his fourth K of the night. He's through seven shutout, two-hit innings. The #Orioles have not scored for him. Three Ks for Mancini tonight. Adam Jones with a one-out double to left-center to put the #Orioles in business in the eighth. Manny Machado draws his sixth IBB to get to Davis. Chris Davis strikes out looking for the #Orioles season-high 15th of the game, mark Trumbo pops out, and they leave two more. Gausman back out for the eighth. We go to the bottom of the ninth 0-0 in Oakland. Presumably, someone will score at some point. Kevin Gausman holds the A's scoreless through nine, what an impressive night of work by him. And we so go on to the 10th. Career high 9 IP for Gausman. Jones hit on the hand by a pitch from Casilla and looks in major pain. Right wrist for Jones, but he's staying in the game. 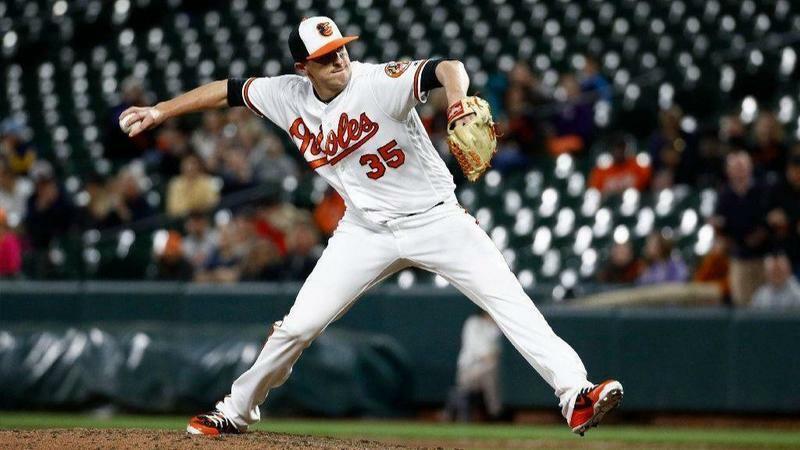 Gausman is done for the night, it's Givens in for Baltimore. Two hits, 0 runs in career 9 IP for Gausman, wow.